For clarity, I will be flying on a BA Boeing 777-200 or 777-300. Our seats will be at the front of premium economy. 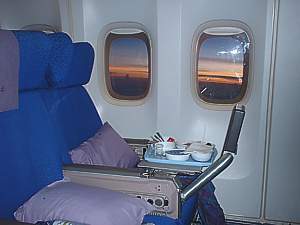 On most seats there is another seat in front where the folding tray table and the entertainment system are all hooked into. Obviously when you get to the front of any class in the plane, there will be an extended gap where there are no seats in front are close enough to serve as a usable anchor for the tray and entertainment system? In the first rows of economy, those tables fold out of the armrest. It is normally slightly wider than the armrests behind, and closed, to contain the folded table. This works fine, unless your legs are much thicker than average, then it would not fit over them. It will be something like the image pictured below, the video screen will come out on an arm from the front of the seat. The tray table will come out from the middle arm rest folded in two.